Along with Leslie Mann, Ali Larter attended the premiere 'Blockers' yesterday evening(April 3rd) at the Regency Village Theatre in Westwood, CA. 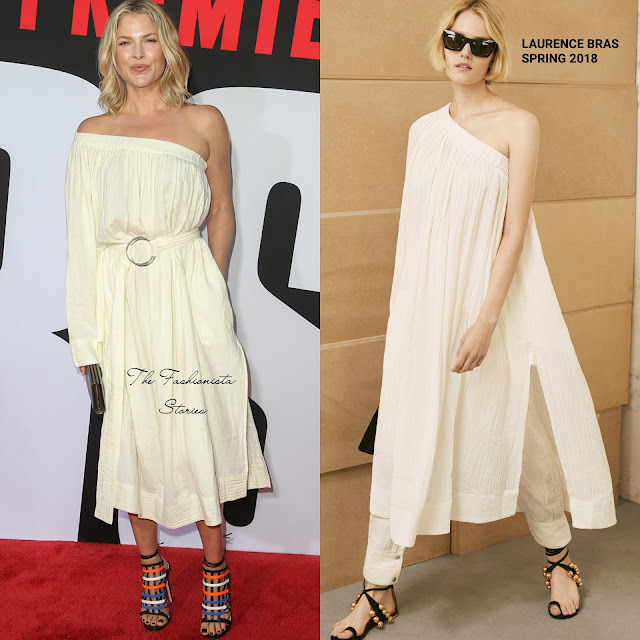 She hit the red carpet wearing a LAURENCE BRAS SPRING 2018 ivory one long sleeve tunic dress with side splits and pockets. Ali made this a winning look thanks to the styling. She belted the waist which added much needed balance to the shapeless dress. To keep her look interesting, she styled her dress with RUTHIE DAVIS black, orange, white & blue panel sandals. Minimal make-up, center part waves and a black clutch finished up her look.